Scientists say that prolonged sitting is bad for your health. So I try not to. Instead of sitting down at my desk each day for work, I stand at it. And, in fact, I walk. As I've written previously, I walk while I work, at 2.5 miles per hour. I'm walking right now as I write these words. Though my first standing desk was really a normal desk with cardboard boxes stacked atop it, I now use legitimate standing-height desks instead. But while I tread all day long, many standing desk users prefer to take occasional seated breaks. That's where height-adjustable desks come in. I recently spent a couple months experimenting with a Mahogany UpDesk, from a company also called UpDesk. 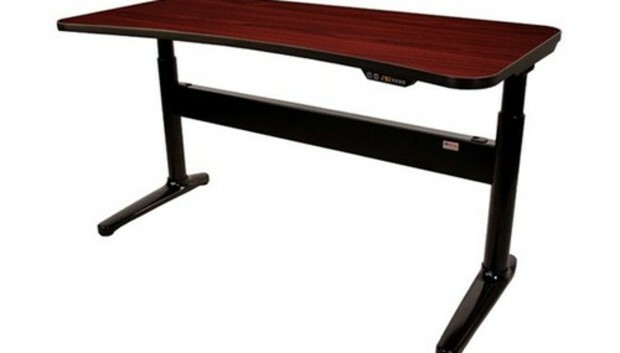 UpDesk sells a variety of adjustable desks, both mechanical (CrankUps) and electric (PowerUps). The Mahogany desk I reviewed was an electric one, the medium model: 60 inches wide by 30 inches deep. It can go as low as 26.5 inches tall, and as high as 42.5 inches tall. That peak height, 42.5 inches, is a smidgen low for my needs. I'm 6'2", standing atop a treadmill that adds several more inches. If you purchase the optional $59 wheel set for the desk, that adds another three inches of height to the setup. The desk is fairly painless to assemble; it took me about 30 minutes, and I'm terrible at such things. It would have taken half that time if I'd enlisted a helper. (Unless you count the time required to first make a friend). There are six buttons on the front edge of the desk: Up, down, three numbered presets, and an S button. The up and down buttons--surprise!--raise and lower the desk, respectively. The electric motor is quiet, and the movement smooth. You use the S button to set the three height presets, and then can use the numbered buttons to move to a saved height automatically--sort of. Once you've saved a preset, you press the right number, and then press and hold either arrow, and the desk moves to the proper height and stops automatically. I wouldn't mind a preset option that just let me tap the height I wanted and then took care of the rest. An LCD display between the arrows and the other buttons indicates the current desk height in inches. It's easy to read, but it's always illuminated which seems a bit gratuitous. As a desk, the UpDesk worked just fine: It held up my laptop and keyboard and trackpad and water glass, and did not let them fall to the floor--success! I did notice that the Mahogany surface was a fingerprint and dust magnet, but it was nothing a little generic cleaning spray couldn't handle. Standing desks are the future, folks. And if you're ready to embrace the future, but not prepared to stand all day long, a height-adjustable desk makes darn good sense. UpDesk's PowerUps line works well, adjusts easily and quietly--provided the height meets with your needs.